Late on a Friday afternoon, SparkFun got a call from Joe Keeley, Chief Counsel to the Subcommittee on Courts, Intellectual Property, and the Internet. We get a lot of odd calls but this one was especially interesting. Joe was responsible for finding industry experts to help educate the House of Representatives on the pressures on business in regards to copyright and intellectual property (IP). 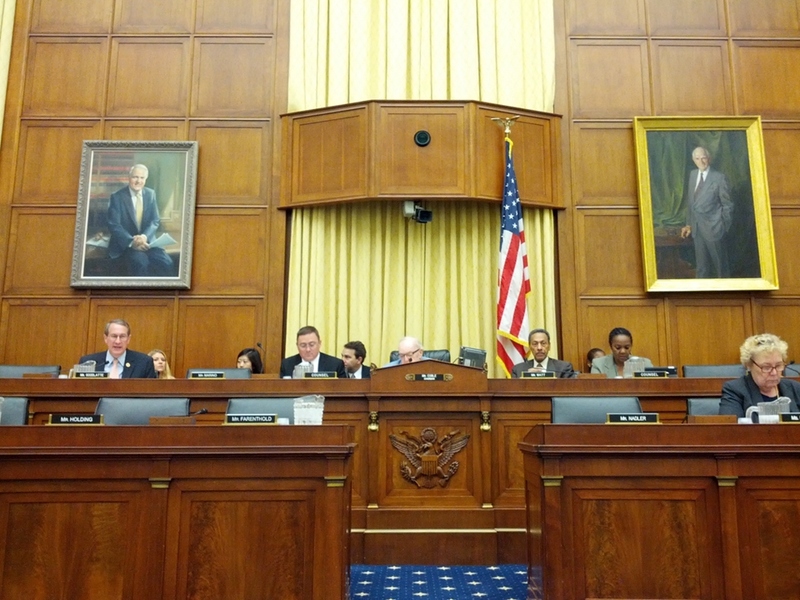 Joe wanted SparkFun to speak in front of 20 house subcommittee members the following Thursday at 9:30AM in Washington, DC. Are you kidding?! I jumped at the chance! By Sunday, I had received my formal invitation, tickets for my wife Alicia Gibb (president of OSHWA) and I were booked to DC, and together we began a two-day writing odyssey. Alicia did an amazing job proofreading and improving my written testimony. I can't thank her enough. SparkFun is transparent about almost everything we do and contributes as much as it can to the open source community. Checkout my TEDx talk on IP Obesity. I feel strongly that, as the patents system is currently structured, intellectual property leads any business to misspend resources at best, and at worst, can do serious harm to the health of a business. Joe had gotten my name from Michael Weinberg at Public Knowledge. Michael is a big proponent of Open Source Hardware; we had met a few months before when Public Knowledge hosted the Open Source Hardware day in DC. Public Knowledge and the Electronic Frontier Foundation (EFF) do a lot to try to curb overreaching patents and are attempting to help guide the reform of copyright and patents. I was happy to give my input and share stories of what SparkFun has been up against when it comes to copyright and IP (SPARC International was a thing, and ask me about SparkTruck someday). To prepare for my testimony, Joe instructed me to watch some of the previous hearings to get a sense of how the hearing would work. I would be testifying at the second hearing of a two-part series on Innovation in America, so I watched the first episode. It was slightly terrifying to read and listen to Sandra Aistars's testimony. She represented the Copyright Alliance and is exceptionally well-spoken! The entire panel of speakers was very strong, and I felt completely out of my league. Watching this previous testimony really set the tone for what I was about to do. The Rayburn House is located right next to Capitol Hill. Here is the hearing information and my written testimony. This is how testimony works: Each panel member (witness) is asked to compile written testimony and have it turned in 48 hours before the hearing. This gives committee members (and lobbyists) a chance to read the viewpoints and to compile questions to ask individual members or the panel as a whole. The written portion can be as long or short as you care to write. At the actual hearing, each panel member is given five minutes to speak = 25 minutes. Then the most senior member of the committee (Mr. Coble) is given five minutes to make statements and ask the panel for clarifying questions. After they have used up their time the next ranking member gets five minutes. There are 20 members so this hearing could last for two hours. I rather love Q&A, but this was going to be a task! The first and last time you'll see me in a tie. The hearing was scheduled for a start time of 9:30AM in the Rayburn House, which meant Alicia and I needed to get to the building by 8:30AM. I may need to remind some readers that 8:30AM DC time is 6:30 Colorado time, which means my wife and I were up at 5:30AM. This was going to require lots of coffee and doughnuts. It's much more entertaining to watch Stephen Colbert speak on immigration, but you get the idea. Checkout the video of the hearing if you need to kill two and a half hours. 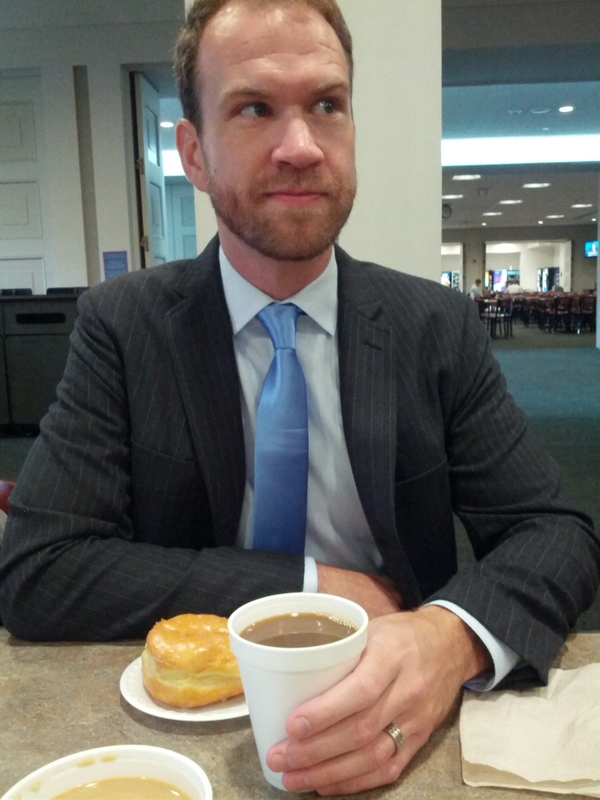 My oral testimony begins around 43:00. At 1:20 there is a fun question/interaction between Representative Marino and myself. It's a bit like running around in circles, but it was fun to debate someone! EFF: Tech Sector Does Its Part to Promote Reality-based Copyright Policy: Will Congress Listen? 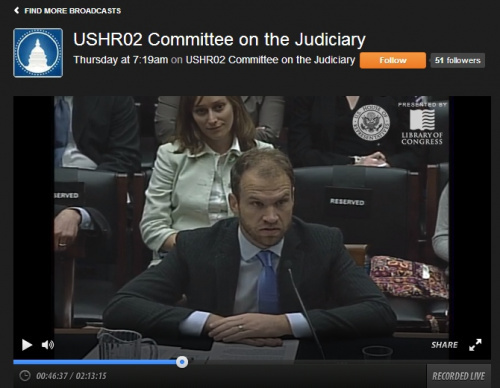 Public Knowledge: Copyright Hearing 3: Is Congress Ready for a Balanced Debate? SparkFun has been lucky we haven't been sued by patent trolls. Checkout the EFF's Trolling Effects website. It's a great step toward curbing the problem. I encourage Congress to ask for help from actual businesses and patent holders (not portfolios) to create patent reform. In the current environment, more and more of my peers are filing for defensive patents because the fear of trolls. It costs millions of dollars to file and use a patent in defense (counter suit). This money would be better spent on research, innovation and salaries. There are times where IP and a patent monopoly should be granted. However, Congress should be finding ways to spur innovation, and the best way to do this is to limit the number of monopolies granted. At the speed at which technology is moving, it's time to shorten the length of a patent or copyright. Twenty years for a patent and 100+ years for copyright is truly burdening small inventors and innovators. “Patent law encourages cumulative innovation, both by dangling the patent before the inventor as an incentive to invent in the first instance and by requiring him to disclose to the public his invention so that science can progress by building on the divulged knowledge” Iowa Law Review, 2009. From Kipp's presentation. Politics are very messy. I am thrilled to have gotten the chance to participate. Overall I was impressed that most committee members were genuinely seeking out an education in the interaction of business and patents, and I believe I helped push patent and intellectual property reform in the right direction. Now I gotta get back to building stuff! At 1:20 there is a fun question/interaction between Representative Marino and myself. Mr. Marino, in an ideal world, protection and compensation for something like a teleporter would be trivial. I am not a philosopher nor an idealist- I am a businessman. I can't pay my employees with concepts like "fair" and "just", and neither can a company that makes teleporters. What the market will decide is that this product (Hold up the foreign Fio) in my right hand will outsell the original because it is cheaper and has improvements- regardless of whether or not that fact is fair. Short of marching into every manufacturing shop that can make one of these, there is no way to enforce ideal protections on a global market. Pragmatically, I and my generation of CEOs have chosen to innovate. Because I'm a innovator, not a global policeman, I made the product in my left hand- quicker and cheaper than any legal action I could take against a foreign manufacturer. It's not a piece of paper that keeps customers returning to my company instead of finding parts abroad, it's the revisions I was able to make, the shipping speed I can guarantee, the real tangible benefits that my customers can feel. A real market will always prefer a customer's real benefit's over a government's ethical ideologies. Rather than let that fact take business away by being underbid, American companies need to use that fact to our advantage by flexibly making better products. That's always been the American way. With respect, we are not dealing with a hypothetical here. I have physical evidence in my hand, right here, that any effect this would have on our economy is an effect we already have to deal with. Nothing decided in this room or nation will change the fact that we compete in a global market. I and these other witnesses can attest that this is a very real part of business that creates a very real, quantifiable loss of wealth. That lost wealth is as real as intellectual property protection is not. We have had to, and have, solved this problem- that's why we're profitable and Kodak is not. SparkFun does not have a 'like' button. You madam/sir get the much sought after +1. I wish I could have said this verbatim. I don't want to start a huge deal, but I can't see it. The costs and time and research it took to develop the integrated circuit industry are huge. Deposition chambers, rapid thermal processing, turbo-molecular vacuum pumps, 12 inch diameter (finished) silicon boules, and sapphire as well to make the IR rods for peering inside RTP chambers, and on and on. Would this ever happen in an open environment? When a single machine for one step in the process costs several million dollars? This discussion is mighty highfalutin. Like most of us, Sparkfun is a bottom feeder, not a tech innovator. Take finished high tech components designed and manufactured by real engineers and scientists with real brains and provide a minute amount of what might be loosely called engineering to make it easier to use in a lower tech lab or work space. How often has Sparkfun had to revise a double sided 1 square inch PCB? I'm nearly that good myself! The innovation is in the web site and back end, the promotion that goes well beyond previous sellers of this fare, the shipping and inventory and fulfillment. Wouldn't you say it is much more like a tiny Amazon than an engineering operation? This is not to denigrate, because it has been fantastic to watch, but to get back to Earth. Can this work with something that isn't like Sparkfun or the clones? That takes big investment in time, brains, and money? Could you Kickstarter a Moon landing? (Maybe you could. The latest pricing on SpaceX heavy is very attractive. However, they use Werner Von Braun's engine, which took the resources of two nations and 40 years to develop). So maybe this is a sort of post-innovation idea. You can open source and improve and "innovate" with things AFTER they have been made possible by very big long term projects that would never happen in an open environment. Whaddaya think? Wouldnât you say it is much more like a tiny Amazon than an engineering operation? In business terms, the similarity between us and Amazon is that we sell things on the web and mail them to people. That's about where it ends. It's not just that Amazon is infinitely bigger than us, though that's a factor - quantity is a kind of quality, after all. More importantly, it's that Amazon is a generalist builder of systems for eating entire segments of the economy alive and commoditizing their outputs. I occasionally wake up at night in cold sweats that the market we serve will become a blip on someone's radar at Amazon and they'll flip the "render this unprofitable for anyone with infrastructure smaller than a national economy" switch on us. We'd probably survive, but I expect it'd get ugly for a while. So maybe this is a sort of post-innovation idea. You can open source and improve and âinnovateâ with things AFTER they have been made possible by very big long term projects that would never happen in an open environment. Whaddaya think? I think that invoking publicly funded grand-scale R&D projects and the collective output of the scientific community for a couple of centuries undermines your whole shtick from at least two angles, but I'll add a third: What's the economic impact of open code in software across the last 50 years? How about since 1991 or so? The notion that the processes of open access, distributed knowledge, and peer review are somehow "unproven" at this stage in our wild slide into the science-fiction future on the backs of exactly those forces is wildly ahistorical. It's a fiction created and nurtured by dishonest, manipulative propagandists directly in the interests of authoritarianism, social control, and hegemony. How you can make money doing a given thing is always a changing question, but so what? We've made money for around a decade. We know we'll make money at least a little while into the future. My paychecks clear, I make rent, I keep hacking. This is as proven as anything I can reasonably expect as a denizen of this economy, and the work itself is often aligned with a set of basic principles that a student of technical and intellectual history can see producing results as clearly as anything you'd care to name. Are we small potatoes in the technical economy? Of course we are. It doesn't necessarily follow that the burden of proof here is on us. Technical culture as closed loop isn't some kind of state of nature against which we're foolishly casting our lot. It's a construct that must be maintained at vast cost to society, policed relentlessly, and enforced against the grain of common sense and simple human decency. In case anyone is still reading, I had a thought this week. I bet 95% or more of the Sparkfun employees (and Adafruit and similar) came of age and began their careers during the last two administrations - the last 14 years or so - the two most profligate administrations in American history with unprecedented government spending and borrowing. Zero percent interest loans and truly mind boggling amounts of money simply given to preferred businesses. Now, in this economic environment, the open source movement began to succeed and look pretty attractive. So much so that open hardware now looks good. The natural question for anyone with a greater time perspective is, can this model work in "normal" economic times? Can it work in a free market, or at least a market with less government direction and influence? One without subsidies for the currently fashionable or capricious restrictions on activities that are out of fashion? The problem is that we do not have a reference from pre-Bush/Obama sized government and economic policy. We can look way back. For example, before copyright or copyright enforcement, the impoverished great composers and writers. When the royal patents and the guilds came into being to protect one's life's work. Mathematicians and scientists did not publish. The things they discovered were too valuable to give away. Some one who could solve a quadratic could make artillery tables, or someone could have a quick way to computer compound interest. To share it was to give away your meal ticket. There are patent and copyright issues that look like abuse today. Will they look like abuse when the pendulum swings - one way to socialism or another to rational self interest or ? (Lets make it a compound pendulum). Will open source or open hardware look like good ideas then? It isn't just a government spending or economic issue. The world has changed drastically during the last two administrations with the proliferation of the internet and personal computing. Communication with any part of the world is available in an instant, allowing for the exchange of ideas from various cultures that many people would otherwise never be exposed to. While we are a business and hope for the open-source hardware movement to succeed, this is also one of the most caring communities I have ever had the privilege to be part of. There isn't a single person I have met at SparkFun, through classes we are teaching, other businesses we interact with, or in the open source community whose main goal isn't sharing knowledge for the greater good. The great thing about exchanging ideas and information is that it encourages and inspires everyone to come up with new projects/ideas/tools/goods with which to make money. Perhaps the current growing success of the open source movement simply indicates a shift in overall social priorities. Yes, we may be a younger company, but that does not mean that we don't have the power to impact change by pursuing and sticking to things like open source. Hind sight is always 20-20; but without new influxes of ideas, trying new approaches that may fail, and learning from all of these experiences, the world would be stagnant. And honestly, that just sounds boring. Is this an answer to the question? I get the idea that you have met many nice smart people. I work with people daily that I would not have in the past, in China, Germany, India, Indonesia, Australia. I don't the see cultural influence except in business practice and approach to relationships. Mostly they are adopting western science and engineering. As for warm and fuzzy and the common good, I do not give any extra gravitas to someone working for the common good. In fact I ask if they are working on their own personal interests and the common good is a side affect. I much prefer people who work for their own self interest. The under 30 generation comes from the schools with such things as mandatory volunteer projects required for graduation. They have had to wrap their minds around such contradictions and consider them legitimate requests. Even give oral reports before groups of teachers who score their "volunteer" project. I taught in these schools so I expect these mental gymnastics to be intertwined with more common sense in that generation. So, it remains. Is it the improved communications? COULD it be the freak economic environment? I guess we will have to see what happens when the piper is paid. If the US begins using domestic oil and builds nuclear plants and a few other things, that time may not have to come. Economic growth can catch up with dept. It might just be clear sailing into Neuromancer land. personally, I think there is a serious humpularity to overcome. I'm still reading, but your argument-from-I'm-older-than-you doesn't strike me as any more coherent than your argument from you-guys-are-small-fish. The ur- texts and languages of modern hacker culture have their proximate origins in the 1950s, 60s, and 70s, and arguably their more distant ones in work that's been distributed and current in the culture since 'round about the time of the Enlightenment. Meanwhile, the Debian project just turned 20. Perl is, in the words of a friend of mine, old enough to rent a car. Wikipedia tells me that McCarthy's design for Lisp was first published in 1960. The internet itself, built on open protocols and open code, had been around for the better part of two decades, and the web for the better part of one, by the time G.W. Bush took office. The actually-existing market and our competence will decide whether we keep making money. Nothing guarantees our business model or anybody else's. But open code is pretty clearly one of the great engines of profit and functional infrastructure in the last 3-5 decades, and I remain profoundly unimpressed by claims that it might just spontaneously stop working one of these days because it's often founded in motivations and processes more diverse than straightforward selling in some conceptual vacuum where states and academic institutions and personal causes and grand artistic projects never taint the purity of the market. There are patent and copyright issues that look like abuse today. Will they look like abuse when the pendulum swings - one way to socialism or another to rational self interest or ? I dunno. Maybe we should ask Benjamin Tucker what he thought in 1899? It's not exactly impossible to find critiques of IP law and its potential abuses going back rather a long ways in a couple of intellectual traditions, including the ones that gave birth to modern American right-libertarianism and a couple of the uniquely American flavors of left-wing anarchism and socialism. Or for that matter in the writings of the Founding Fathers themselves. Hmm. I have to digest that. You write like a political science major who took extra philosophy courses and I have not been in those kinds of bull sessions since the 1970's, when David Berlinsky was teaching philosophy of science and general relativity at the same time. I don't know much about modern hacker culture because the word has changed meaning so much. Home Brew Computer Club hackers I know. Socialists and anarchists who decided all information should be freely available. Cap'n Crunch used to call me at 2 AM from Hawaii using phone phreaking and operator interrupts whenever he thought my compilers were not doing what he expected. Don Lancaster stayed with me each year for the West Coast Computer Faire. Thus the argument-from-Iâm-older-than-you straw man is really the much-more-experienced-with-original-hackers-than-you and on your terms I would not expect you to find it coherent. Modern "hacking" as seen in the maker spaces and such is rather benign compared to old school. Your list of what I imagine are counter arguments or counter appeals to authority are interesting but I don't learn anything. I'm after data. I can get an Arduino Mega on eBay for $14 with free shipping from Shenzhen. You have the same basic product for $59. Have you seen an effect on sales? (And why do they think they have to call them Funduinos and Megabinos, etc? Old habit?) Do you get way more downloads than customers? It is not a great example because you have not invested much in the product. Is there anything Sparkfun sells that you designed and provide documentation and software support for that is also open hardware? How has it worked out? Ah, here is what I need to know. Does the open hardware organization have forums and IRC? Are there active discussions of what works and what does not? I'll join if there are. If it is all blind faith and marketing of the idea, then no thanks. I want to see an 8 layer board with a current 1 GHz ARM or better (TI3358 for example), with full Linux drivers for all the GPIO and good user docs sold as open hardware. Can't count boards subsidized by chip makers of course. Will it work? I'm also curious about how you see the future for a technologist. The end of the long term company perhaps? A sort of series of groupings for common goals - some concurrent - and move on? I can picture it. I also lived it in the glory days of silicon valley moving from startup to startup. Very gratifying creatively. Rather brutal emotionally. Nearly all startups there fail. Failure was so common that a lot of people sold their Apple options as soon as they vested. "The notion that the processes of open access, distributed knowledge, and peer review are somehow âunprovenâ at this stage in our wild slide into the science-fiction future on the backs of exactly those forces is wildly ahistorical. Itâs a fiction created and nurtured by dishonest, manipulative propagandists directly in the interests of authoritarianism, social control, and hegemony." Just thought that deserved to be read again. Did you get that from Engels? Farrakhan? OK, that's not fair. Chomsky! I knew it was familiar. That's ok, Congress doesn't get it either. Open sourcing something and improving on an idea is exactly why the patent system was created. Too little technology was being shared so the forefathers created patents to facilitate and encourage disclosure of innovations into the public domain for the common good. There is a period of monopolistic protection to try to incentivize the inventor, but the ultimate goal was to get more into the public domain. All the innovations you mentioned happened in absence of patents. All those process improvements were invented and created to allow something else, the manufacture of ICs. Only after the invention was created did the parent companies' lawyers step in a file the paperwork. Why didn't they just patent the process and sit back? Because the company knew the real money was to be made selling ICs, not getting royalties on patents. Companies have lost focus and the patent system is being wrenched to allow it. The modus operandi is now: brainstorm something, patent it, and just wait to see if someone can actually build it. This new normal is what scares me and should scare you too. SpaceX is doing some truly innovative things on the shoulders of giants. You state the launch pricing looks attractive. It took business competition, not a company sitting on a patent, to create the innovations that allowed SpaceX to lower costs. SpaceX's often linked cousin -- Tesla -- is also working on some crazy sh%$. Have you read about hyperloop? Checkout the last page. Hyperloop is considered an open source transportation concept. I didn't want to give the impression that I disagreed regarding patents. I have been down the rabbit hole when I was younger and would never do it again - unless I invented the Transmat or Repelletron or Interocitor. I'm wondering about how big you can go with open projects that use real innovation. It is true that NASA was governmental and it is also true that back then virtually everything they did was public with a lot published directly in NASA Tech Briefs. I was able to get Shuttle and B1 tile samples to make portable black body calibrators for RTP temperature sensors. It is a recent development that NASA allows contractors and even their employees to patent things, to which I am opposed. Submarine patents and portfolios are equally distasteful. On the other hand, the stories of the guys who invented the windshield interval wiper, and the dye LASER are edifying. "Only after the invention was created did the parent companies' lawyers step in a file the paperwork." This is opposite of my own limited education on the subject, though I did meet many of the principles when I lived in Palo Alto and Mountain View. In my experience, venture capital always asks if you have patents before you start. It is frustrating, but a fact. The invention of the integrated circuit is awash with people filling patents for things they could not even build yet, dating back to about 1949. I want to make some open hardware devices. Most of what I do has 6 or 8 layers and the latest ARMs. I don't see this kind of thing with the open hardware symbol. Mostly simple two layer boards with simple layouts and a few components. Why is this? Does the copying risk versus design and prototype cost intersect somewhere around 4 layers and 20 components? I can easily understand open hardware on the small things. They are easy to design and make. They are a lot like the breakouts. Who will copy when it is so easy to buy and they are not that expensive? For more complicated projects, what is the tradeoff? I'm sure you have experienced the paranoia of Chinese manufacturers because it is so easy to copy anything. They will even x-ray a multi-layer PCB. So, it is a tough nut to crack. BTW, I looked at the hyperloop. I would guess that anyone over 50 has seen 10 or 15 variations on this since the 1960's. You can probably find one every couple years in Popular Science and Popular mechanics. He should build a test system from LA to Vegas. As an aside, fluid flow in tubes has some very strange properties. "Plugs" of turbulence form in the tube and travel along. There is a major WTF involved. The turbulent zone does NOT travel at the same speed as the fluid. It is slower. Laminar flow fluid enters the zone from the rear, gets turbulent, then exits as laminar flow out the front!!! The plug is sort of bullet shaped with the cone pointing in the direction of flow and the rear cone also point the same way. No one has ever solved the equations for turbulent flow except trivial cases like standing still or a 2 dimensional very simple case. Given the amount of tax money given to Tesla, I would leave them out of the discussion. I was quite hoping Hyperloop would come up during the conversation, especially during the "teleportation" comments. The closest thing to teleportation on the horizon looks like it will be open sourced, will compete in the marketplace for 1/10th the cost of the closed source alternative, and Congress should do what they can to ensure that open source licenses and open source business models for companies that OPT to choose this model can do so without undue worry about the legal environment they operate under. Most of the congressmen and congresswomen missed the salient point - it's not about forcing companies or inventors to go open source. It's about creating a harmonious business and legal environment that allows innovative new business models to work in peace with existing models. This lowers the cost of legal entanglements, and increases the investment in innovation - Nate's case was strong on that point. Thank you for trying to represent us. I hope our representatives listened. If I may suggest: add your voice to the debate. Take Nate's points, hammer them into a brief message, and send it to your Congressperson. Political progress is something Makers can help make. Great point to bring up! Thanks for the friendly reminder that we can all get involved. 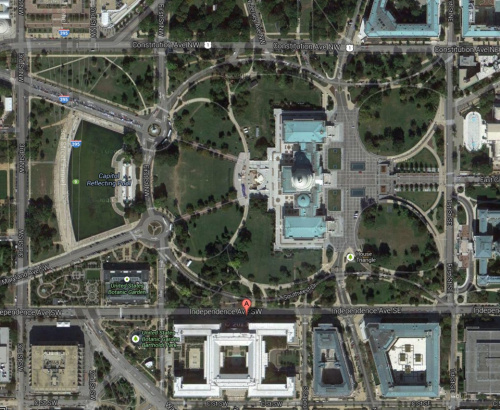 Is it just me, or does the aerial view of Capitol Hill look like the Raspberry Pi logo? This is a sausage moment ! Anyway, if they only stopped congratulating themselves, maybe each could have asked more questions in their 5 minutes ! The tax break idea, it would be really hard to police as to how tangible the release was in order to get the break. I have to look at it in terms of all the tax abuses by large companies ( setup your parent company in the Caymens yet Nate ? lol ! ), I could see IBM releasing a source file as 500 individual items ( say by function ) and getting a break for each, instead of one item for the file itself. Maybe I'm jaded, but I can't hear the word tax break without thinking how a large corporation will abuse it ! The fact that Micky Mouse or any Disney stuff is not in the public domain, and will never be, shows how corrupt the system is. They wont abuse it because a tax break simply would not work, it's crazy talk. Policing is certainly an issue but also the break itself would have to be incredibly large to make it worth it. And for the little guy, forget it. A patent is his only protection (if he can afford one). If Apple invented some new gotta-have-it device with new technologies and a hat, how much do you suppose they would have to get in tax breaks to make it worth them releasing the technologies to the public where their competitors (particular the foreign ones) would swoop in and make it better and cheaper (or at least cheaper) thus killing a large chunk of Apples market for the thing? Not to mention the value of having Apple pay for all the R&D to develop the technology while others sit back and reap the rewards. In reality, while I love open source and think it helps bring out the creativity in a whole lot of people that might otherwise never have that chance, pretty much anything "earth moving" requires the type of research and equipment which those evil profits provide. Now I am not saying companies do it right either, most are slow moving and often can't see their nose in front of their face but they do have the resources to throw at something once they do decide to do it. I agree the time frames are way too long and should be cut back to no more than 5 years for a patent. They should also be considerably cheaper to get, something within the reach of an average Joe. This would promote the goal of getting things out into the public domain and encourage even the backyard inventor to contribute. You're right, but the current system is actually more broken than that. A large company ignores any patent it wants, and waits to be sued, knowing it will make more profit between release and an injunction, than it will cost to defend themselves. Just look at Apple and Samsung. Then, if the product is successful, it will already have the foot in the market, and they can make the changes to avoid the patent. A system that encourages people and companies to ignore patents is a broken system. A lot of the problems relate to software patents, patent protections for garbage, and do nothing but hinder innovation and progress. My first exposure to patent litgation involved a stage hand in NYC. He bought a patent from someone for around $10K for moving lights, entertainment lights that move around, change colours etc. This was before they had really been invented. He waited for about 10years for the company that really started that part of the industry, a company called VariLites, started in part by money from Pink Floyd, to become successfull. He then sued for patent infringement, and won several million in an out of court settlement. He would have got a lot less if he had sued when VariLites started, and I think there should be a statute of limitations based on "knew, or should have known" related to the infringement. I agree on time limiting patent lengths. I would like to point out the fallacy of 'the little guy'. Patents rarely protect anyone with less than a few million dollars worth of lawyer hours. It takes 30-50k to get a patent (perhaps in the reach of LG) but 10 to 100x that to enforce it. On your opensource point: I do not care what other companies open or close. If someone invents something you think is "ground breaking", they can patent to their hearts content. I honestly don't care what people copy from us (they are going to do it, patent or not). What really keeps me up at night is the fear that a big company (you picked Apple) will sue us for infringing an illegitimate patent. Rounded corners comes to mind. I guess I wasn't clear on my point about the little guy. Andy4us is right about the system as a whole being broken. It is broken in so many ways that as you correctly point out it is beyond the resources, in terms of financial, time, and labor, for "the little guy" to even think about a patent. That's what I meant by "cheaper" Also, you are absolutely right about "illigitimate" patents. I recently heard that Microsoft held patents for various things like text boxes and check boxes, etc, and now several cell phone OEMs that use Andriod OS must pay them royalties that just blew my mind. One of our competitors has a patent on taking several off the shelf products and putting them together in a particular configuration, again blows my mind. I always thought patents were for actual inventions? Obviously there is no simple solution and unfortunately I sincerely doubt congress is going to change a thing. I work now in the medical software field. About 6 or 7 yrs ago, a company started suing companies for their patent to burn patient medical images to CD. The first company they sued, ran through about $2M, settled out of court, and couldn't sell their product in the US, only rest of world. Not sure about any monetary payments. They then sued the company I work for. We spent a lot of money, but won. It is now going to appeal, and we also invalidated their patent. The company that owned the patent, after the first lawsuit, is, from what we can gather, owned by the law firm in LA that did the first lawsuit. I agree with this. If you give a tax break for each open source item you release, a company would just break up their circuit board into multiple pieces and release each peice for an increased tax break. But if it was a tax break for each item that your company sells that you also release as open source, and the size of the tax break was proportional to the amount of product you sell, then it might be more effective. Something like you get a $0.05 tax break for each item you sell that you also release as open source, then there would be an incentive to release as open source major projects. No SparkFun branches setup in the Caymen islands yet, but ask me again in February when the airport is shutdown from snow. You're correct - policing any policy is hard, especially tax breaks and loop holes. The tax-break idea certainly needs work but I wager the benefit will outweigh the cost. I recommend to everyone to watch the FULL hearing. Nate's part was fantastic, but all witnesses provided valuable insight into the problem at hand. I could tell that the representatives present on the issue didn't know much, and they definitely learned more about OSHW. It's a bit rough to watch it all and I wish the audio was better, but thanks for the kind words! A very long time ago, in tech terms, I developed a hand held computer and spent a lot of effort banging my head against the board of investors that releasing the hardware and a software development framework as an open platform were the way to go. We had a target selling price at which we would have been very attractive, a highly capable platform with innovations like flashed bios, touch screen graphics, serial IO and removeable storage. We were ready for market a year or more ahead of the palm pilot that was a brick compared to our platform. The board spent a fortune and valuable time trying to defend the IP on the platform before we even got to market. History shows how successful they were at this! Palm made millions and we dissappeard. Had we got to market first and continued to innovate who knows what might have happened. The elephant in the room is the fact that the fact that by it's very existence the committee has validated the fact that current IP protection is unworkable. Followers, copiers, 'the Chinese' if you'll excuse the gross generalisation will always be just that. What real market leaders need to do is to concentrate on the innovation process itself. Ensuring that upcoming generations are capable of innovating is perhaps as important as anything else. To pick up on a point, if IP protection is not protectionism then what is it's purpose? IP protection is the very definition of protectionism! Thanks Nate and SparkFun for fighting the good fight, for all of us. Congratulations! You can now append "Mover and Shaker" to your name! It's good to see a citizen summoned to testify before a house committee and not need to plead the fifth. Nate, great job and a home run! I appreciate the effort and time you put into this. My family used to own a company that made interior decorator products. We had a similar issue in having to out innovate competition from China. We manly had to keep up with US tastes in color and style but a similar problem. Keep cranking out the hits SF. Nathan !!! You got married ! Shouldn't that be an update for all of us! Congratulations ! This was going to require lots of coffee and doughnuts. I wish team Donuts Coffee Muffins could've been there to help keep you fueled up while you were fighting the good fight! DCM! I still have one of your stickers from the AVC many years ago. Good to hear from you! I needed all the sugar and caffeine I could get my hands on. I like this "And, this is crazy talk, but if you really want to light a fire, give a tax break to anyone who chooses to release an open source product or work of art directly into the public domain." But why not start an inferno? Tax breaks, period. No ifs ands or buts. Open source software plus Open Hardware, plus open source freedom would be a nice goal. Can we open source government? You were speaking to the biggest monopoly. Hmm. Looks like the Judiciary updated their website. The hearing page is here. I can't seem to find the videos... Bummer! Great job Nate! Fantastic points! Thanks, Nate! Your work as an engineer, entrepreneur and political operative is very impressive and inspiring. Thanks in particular for standing up for the little guys like us that work hard to come up with the next greatest thing, but are under a constant cloud of fear that anything we do could be taken away in the blink of an eye by patent trolls or corporations for whom the system benefits. Absolutely the most articulate and direct statement! I am proud to have all of those red boxes in my classroom. Thank you for representing the inventors and and tinkerers. Bummer! Wish I had known you were doing this.. I work for the House (non-political geek position) and would have loved to come watch.. Thank you, both for the time and effort this involved and for reporting back on it. I generally agree with your patent policy remarks, but urge that more attention must be directed to making such policy actually work. Every patent reform act in the last 20 years has seen the US Patent and Trademark Office (USPTO) ask for and get more money to hire and train more examiners, and the net result has been that the USPTO has become a place where dreams go to die. patent application allowance rates are pretty much at an all time low yet dissatisfaction with the patent system is at an all time high. In my opinion, as a registered patent attorney, the overall quality of patent examiners, patent application examination, and issuing patents have gotten much worse. Top level policy is all well and good, but when we charge bureaucrats with implementation and fund, fund, and fund them again to do so and the system only gets worse, it is time to work on bottom level policy too. Having quality patents would go a long way towards reining in patent trolls, which use unduly broad patents as bully clubs to extort high royalties. Similarly, quality patents would go a long way towards acceptance of the monopolistic aspects of patents, if the public could see that there truly has been innovation and that the time limited monopoly of a patent is a just reward for that. Quality patents have to be the foundation on which a patent system is built, or that system will fail. Thank you for taking the time to comment! From your own feedback it sounds like additional funds and examiners will not make the problem better, only worse. So what should Congress do to improve the quality of the patents? I'm not re-assured, as a business owner with no patents, that better patents will curb patent trolls. Is there any other lever that you can think of that would help protect against superfluous litigation? There is a very solid and valid reason that "patents" were included in our constitution. Without the incentive, this nation would be about as creative as any average third world nation. Congress, of course, will try to interfere wherever possible. They are nearly as ignorant as our "journalists" and even more dangerous to this nation. This was really great to watch. Having served as an expert witness in a multimillion dollar patent infringement suit I can tell you patent cases can get really ugly and unbelievably expensive. A patent is really only worth however well you can afford to defend it and it becomes far too easy for a large corporation to simply bury a small company in the legal system. The corporate giants are dumping way too much money into congress to shut down open source anything. I hope you didn't wast your time. Don't forget to try to slip in a little reminder to the bulk of those clowns on the other side of the big table that you'll likely be relaying any and all relevant information back to the masses for consumption. Uh, well, I didn't see any water squirting flowers. If Congress and representatives don't understand that everything goes on the internet (nearly) immediately then I hope this post takes us all in a step towards more government transparency. I was rather impressed by the number of articles written on the hearing. It's good to see all sides paying attention to this topic.